Travis Maril is Coordinator of the string department at SDSU’s School of Music and Dance, and Co-Director of SDSU’s new String Academy. Mr. Maril was a top prize winner at the Fischoff National Chamber Music Competition, has had performances broadcast on “Performance Today,” and has recorded for Naxos. His chamber music partners have included the concertmasters of the Cleveland Orchestra, LA Philharmonic and Rochester Philharmonic, the Miro String Quartet and members of the Chamber Music Society of Lincoln Center. Recent festival appearances include La Jolla Music Society’s SummerFest, Schleswig-Holstein, Bravo! Vail Valley Music Festival and Mainly Mozart. 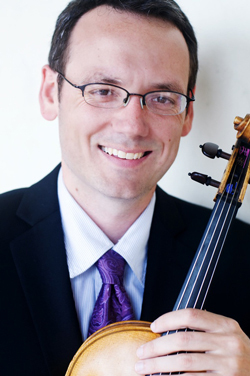 Mr. Maril is Co-Artistic Director of the chamber music ensemble Camarada and also teaches viola at Point Loma Nazarene University. Travis was a Trustee Scholar and Outstanding Graduate at the University of Southern California, where he studied with Donald McInnes and Ralph Fielding. He earned his masters degree from Rice University’s Shepherd School of Music, where he studied viola with Karen Ritscher and chamber music with James Dunham and Norman Fischer. He has also trained extensively with the Emerson Quartet, Brian Chen and Jeffery Irvine.